Do you want to adorn the most trending hairstyle for your coffee date with your favorite guy? It’s your friend’s wedding and you are still not able to decide the perfect hairstyle for every occasion! If you are undergoing through all such situations, then don’t get panic. Our hair experts bring you the list of 5 amazing hairstyles that you can adorn in order to look presentable on a regular basis. At the end of reading this post, you will have the knowledge about the 5 amazing hairstyles that will pep up your everyday look! Do you wish to adorn the glamorous celebrity look for your dinner date or for a day out with your friends? If yes, then this look is simply perfect for you. This is a perfect hairstyle for those with long locks. It looks perfect for long tresses cascading down from one side while gently swooped back from the other side. This is one such look that will definitely turn heads. You can plan this hairstyle even when you have a small party to attend, like a birthday party or a kitty. 1. Prepare your dried and washed hair with a volumizing mousse. Also, apply a heat protectant on your hair. 2. Divide your hair into equal sections of 2-inches. Now take the 2-inch curling tool and curl your hair. 3. Part your hair in two sides. 4. Now take all the hair from the side with lesser hair and pull back your entire hair away from the face. Pin them with bobby pins. 5. Complete the look by spraying holding hairspray. 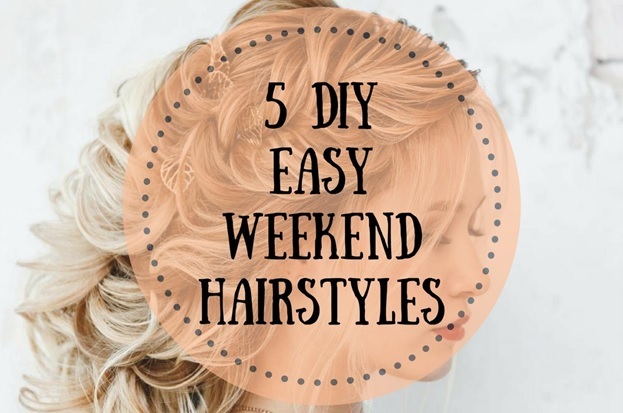 If you have very less time to dress up and still want to bang the day out with your gorgeous, attractive look, then this updo hairstyle is just perfect for you. This is an excellent hairstyle for ladies with varying hair lengths. It is simple yet a chic hairstyle that needs only a few clutches clip and very less to prep up that look. So, when getting that perfect look is of utmost importance and you only lack enough time, then definitely you will love this hairstyle. 1. Get a haircut into side swept bangs. Color the bangs with some highlights. 2. Wash and prepare your hair after air drying them and spraying some texturizing spray. 3. Leave out few bangs and gather your entire hair at the back of your head. 4. Roll them all together into a messy bun. 5. Secure the bun gently with a clutch clip. Make sure that the ends of your hair are placed well in distinct sections. 6. Comb the bangs to one side. 7. Secure the hairdo at one place and finish off with some hair holding hairspray. Have you ever desired of having a hairstyle that is just perfect as that the look of a Barbie? If you have always desired of such a look, then it is now time to make your dream come true. Voluminous curls always look wonderful and can make you look gorgeous. When they are attached to a perfect braid, then this will even enhance your look further. This is a perfect hairstyle to get that amazing ultra-girly look. 1. Wash your hair and then prepare your wet hair with texturizing spray. 2. Pick up 3-inch sections of your hair at a time and curl them properly. 3. Blow dries your curled hair till your entire hair is completely dry. 4. Remove the curler and then gently run a brush through the curls to get soft curls. 5. Part your hair on one side. 6. Now on the other side, take less hair and create a braid at the front. 7. Once the braid reaches the top of your ear, secure it with bobby pins. 8. Now finish off the hairstyle with a hairspray to ensure that it lasts long even when you have a tough day. From the girl next door look to a stunning beauty, this hairstyle will definitely go to heads when you will pass by. This is a heart-stealing look that goes well for every occasion. From a special festivity to any special occasion, to any party, you will love this look and might be getting carried away with it. Just give this look a try, and surely it would amp your appeal. 1. For this hairstyle, it is essential to cut your hair in layers. 2. You can plan a side swept bang hairstyle with it. 3. Prepare your washed hair by spraying some heat protectant and volumizing mousse. 4. Now take 2-inch sections of your hair and straighten them with help of an iron tool. 5. Place your bangs on one of the sides. 6. Complete your look by spreading the hair serum on your hair to get rid of any frizz. If you have frizz-free hair, then you may skip this step. You have not washed your hair and even you don’t have enough time for this. If this is the situation you are suffering from, then you can plan to adorn this hairstyle. It is an attractive and appealing hairstyle that is perfect for unwashed hair. For this, you need to tie all your delicate curly locks into a slightly loose side braid. The completed look can be jazzed up with exquisitely curved side sweeps. Once you are done, your gorgeous curly hairstyle is ready for you! 1. Prepare your unwashed hair. Take some heat protectant and texturizing hairspray and spread it evenly on your hair. 2. Pick 2-inch sections of your hair and curl your entire hair. 3. You can either run a flat brush or can run your fingers in order to obtain soft curls and open the hefty curly look. 4. This will also create a messy look. 5. Part your hair with lesser hair on one side. 6. Leave out the bangs and flip your hair all over to one shoulder. 7. Create a loose braid and secure it firmly at the end with an elastic band. 8. Pull out bits of your hair from the braid to give it a messy yet cool look. 9. Pull back the hair bangs and twist them numerous times. Pin them to the back of your head. 10. Do this for both the sides. 11. Lastly, spray some hairspray to hold the hair in place. You can try these hairstyles, keeping your hair length in mind. Might be initially you may take more time to prepare them, but once you will gain the expertise, you will be able to adorn your favorite look in just minutes.